Is China building a high-tech radar system on a disputed South China Sea isle? (NationalSecurity.news) After having installed sophisticated anti-aircraft missiles on a disputed island in the South China Sea that threatens both commercial and military aircraft, the Chinese may be building a high-tech high frequency (HF) radar on a separate jointly claimed islet, according to a Washington, D.C.-based think tank. 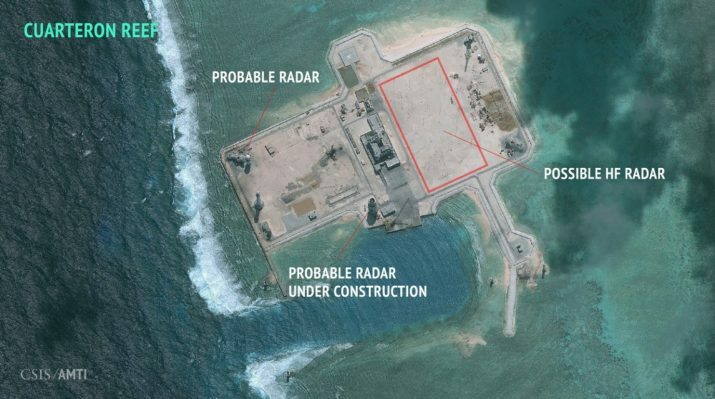 The head of the Asian Maritime Transparency Initiative at CSIS, Gregory Poling, told the Washington Post in an email that the satellite images may show an HF radar installation being built on Cuarteron Reef, one of a handful of islands that China has recently built up under the auspices of a massive land reclamation program throughout the Spratly Island chain. News of the possible radar site comes on the heels of reports that China deployed sophisticated air defense missiles to Woody Island, part of a chain of islands in the Paracels that China has claimed for years but which are also claimed by Vietnam and Taiwan. The Post noted that the Strait of Malacca passes between Malaysia and Indonesia and is a primary global shipping lane; overall, one-third of the world’s shipping and much of Asia’s oil passes through the South China Sea. Beijing has built up seven islands throughout the region and is currently building three runways on some of the islands. The Obama administration has expressed some concerns about the growing militarization of the region by China. Last week, Secretary of State John F. Kerry said he has “serious concern” after been shown satellite images of what appear to be advanced HQ-9 surface-to-air missile batteries on Woody Island. Beijing has said that its land reclamation is primarily for civilian use, but has said that limited defensive facilities are being added. Also, China has said the islands amount to sovereign territory, and that other nations have also built airfields on reclaimed land – though nothing on China’s scale. “It is certainly possible to claim a civilian purpose, and China will,” Poling wrote to the Post. “But just like you don’t need a 3,000-meter runway to land civilian planes, you don’t need a high-frequency radar (assuming that is what this is) to give early warning of commercial traffic. As for the missile deployments, which were first reported by Fox News, reports came at an embarrassing time for Obama, who was meeting with leaders of the ASEAN [Association of South East Asian Nations] countries in California last week to discuss, not so ironically, security and freedom of navigation in the South China Sea. During the meeting, Obama said his goal was to adopt “tangible steps” to reduce tension in the area; the SAM deployment will do the opposite, experts said. “The United States and ASEAN are reaffirming our strong commitment to a regional order where international rules and norms and the rights of all nations, large and small, are upheld,” said the president, as reported by Voice of America. NationalSecurity.news is part of the USA Features Media network of sites.